The last week of February brought a small but diverse selection of avian oddments to the island, and a dramatic amelioration of the weather in the last couple of days of the month allowed some passage of small migrants. Three European White-fronted Geese arrived amongst the Greylags on the 22nd and remained all week, and a Dark-bellied Brent Goose was also present on the 24th. A Knot on the 22nd was an addition to the island year list, as was an unseasonal first-winter Little Gull on the 23rd that was followed by an adult three days later. The first Little Grebe of the year turned up on the 25th, with another arriving on the 28th; a juvenile Glaucous Gull was also seen on the 25th; and the 26th brought a Rook, a Lapland Bunting and a Song Thrush. The first four Meadow Pipits of the year were seen on the 28th, along with the first Lesser Black-backed Gull. A reduction in the wind opened the floodgates for a few flocks of Skylarks to move, with the first noticeable arrival of 35 on the 22nd being quickly followed by increasing numbers up to a peak of 151 on the 26th. 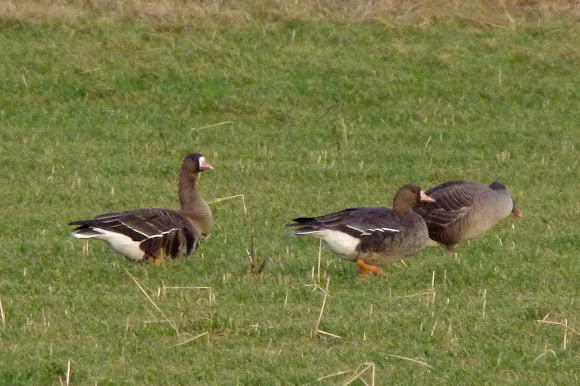 The three White-fronted Geese included one distinctively well-marked adult bird. Picture by Paul Brown. Numbers of other species remained much the same, although Black-headed Gulls continued their slow growth in numbers and the wintering Twite flock was augmented by migrants until it reached at least 94 birds on the 28th. A visit to watch the Hen Harrier roost at Hooking only produced two birds, although at least one other was known to be present on the island. 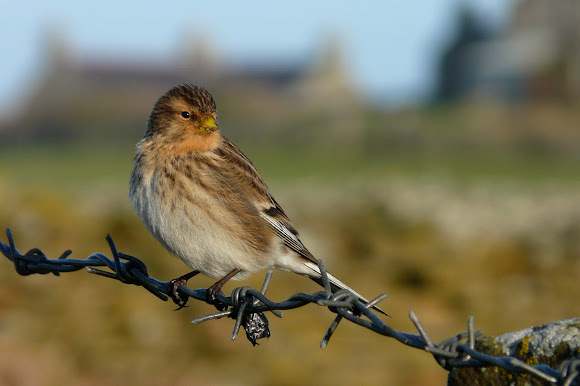 The Twite flock is favouring a field of sacrificial crop near Kirbest. At least two of the birds are wearing colour-rings from Orkney mainland. Picture by Richard Else. 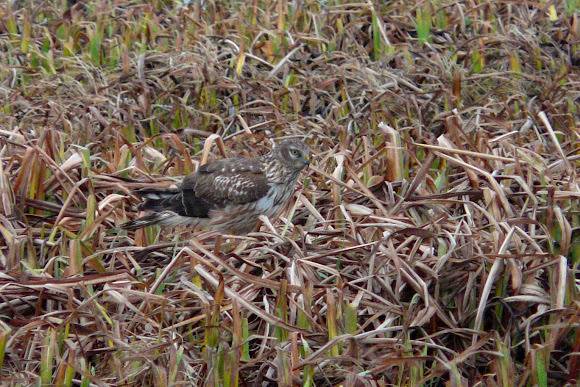 At least two ringtail Hen Harriers have been seen most days. Picture by Richard Else. The weather during the first three weeks of February has been very much less than ideal for birding, with any attempt to venture outdoors being met by unremittingly violent gale force winds. Nevertheless, there is always potential for good birds to turn up here; and we have been doing our best to brave the conditions and cover as much of the island as possible. As is often the case at this time of year, white-winged gulls provided most of the highlights: a flurry of sightings in the first half of the month consisted of 3 juvenile Glaucous Gulls on the 3rd, followed by an adult the following day; a second-winter Iceland Gull on the 5th; and another juvenile Glaucous Gull on the 10th. Two Common Scoters were seen on the 2nd, and a scruffy immature drake was sheltering in Nouster Bay on the 4th, 15th and 16th. A Song Thrush on the 3rd was the first for some time, as was a Woodcock on the 15th that was quickly followed by another a day later. Four Grey Herons flew north on the 11th and a Slavonian Grebe paid a short visit on the 14th. A female Stonechat on the 16th was the only really notable passerine, although a small number of Blackbirds, Redwings and Skylarks arrived at around the same time and a couple of Robins might have been new in. A count of the wintering Greylag Geese came to 1151 birds, with a couple of Pink-footed Geese lurking amongst them. Numbers of other wildfowl have reached 336 Wigeons, 8 Gadwalls, 72 Teals, 13 Pintails, 23 Shovelers, 3 Pochards, 20 Tufted Ducks, 259 Eiders, 26 Long-tailed Ducks, 11 Goldeneyes and 11 Red-breasted Mergansers. At least 3 Hen Harriers and 2 Merlins have been around and a couple of Peregrines were present on the 11th. Reasonable wader counts have included up to 72 Ringed Plovers; 245 Golden Plovers; a solitary, lingering Grey Plover; 109 Sanderlings; 160 Purple Sandpipers; 42 Dunlins; 75 Bar-tailed Godwits, including one wearing what appeared to be a Norwegian ring; and 98 Turnstones. At least 50 Twites, 13 Linnets and four Common Redpolls are around; and up to 25 Snow Buntings and six Reed Buntings have been seen. Although numbers of gulls have been mostly quite poor this month, sizeable flocks have been gathering to feed on the tideline during the strong winds. 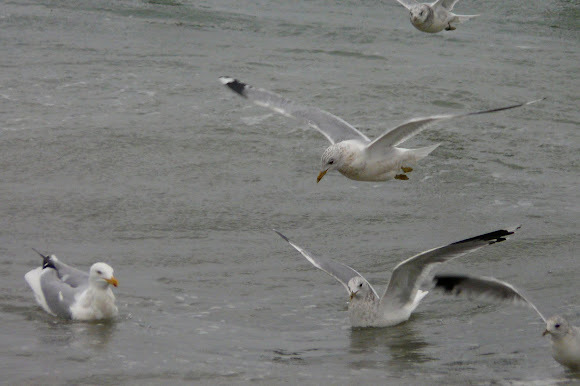 Common Gulls are much the most numerous species present. Picture by Richard Else. The highlights of today were an adult Glaucous Gull and a female/immature Common Scoter. The gale force winds finally did the trick today when three juvenile Glaucous Gulls were seen. Not much else of note; two Redwing, three Fieldfare and a Song Thrush.